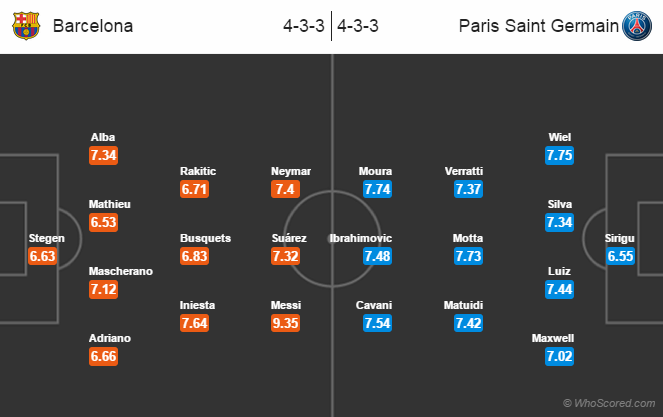 Champions League Group F brings a game between Barcelona and Paris Saints Germain tonight. Both the sides have qualified for the round of 16 but this game will decide who will finish as the group leaders. For Barcelona, Martin Montoya or Adriano will be taking the right-back role as Dani Alves is suspended for this clash. Rafinha is also suspended. Summer signing Thomas Vermaelen is the only player out with an injury. Meanwhile for away side, forward Jean-Christophe Bahebeck is the only player who will miss this clash while the rest squad is fully fit to play. Midfielder Marco Verratti is expected to take Javier Pastore place tonight. Barcelona are unbeaten in their last seven games in all competitions. They have won all of them. Barcelona have the highest passing accuracy in the Champions League this season (90.1%), followed by their opponents (89.06%). Lionel Messi has scored the most goals in the Champions League history (74). PSG have won nine of their last 10 games in all competitions. Zlatan Ibrahimovic is yet to find a goal against Barcelona at Camp Nou. 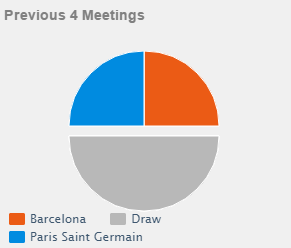 Barcelona 2 – 1 Paris Saints Germain. barca will top the group!